So You Want To Be A Professional Bodybuilder? Do you think you are going to become a pro bodybuilder with no problem at all? That is your problem. Learn if it is worth trying to become a pro! I'm not trying to discourage you here, but after having received emails from 17-year olds who talk about dropping out of high school to pursue a pro bodybuilding career, I wanted to give you a little reality check. Very few are lucky enough to have the genetics to go all the way. My first piece of advice: Don't count on it. Very, very few are lucky enough to have the genetics to go all the way. Unless you have a natural X-shaped body with wide shoulders and narrow hips, you should definitely keep your day job. That is not to say you can't make drastic improvements, but if you want to reach a point where you win enough competitions and endorsement contracts to make a living, you need more than a "great" body. You need it to be "Perfect." A good reality check is to stand in front of the mirror and look up a bodybuilding magazine. Flip to the coverage of an event and take a good look at, say number 7 or 8. Hit the same poses as that guy and compare the picture in the magazine and what you see in the mirror. The guy in the magazine isn't a top name and probably has to struggle to pay the bills. You have to beat him with good margin to succeed. It is important that you're realistic about this. Just like it's naive to pack your bags and head for Hollywood in the hope that some producer will "discover" you when you're walking down the street and make you the next Tom Cruise, it is naive to bet everything on a pro career. Even if you have excellent genetics and think that you have an honest chance of breaking into the pro ranks, at least keep educating yourself as you go. Let's say you move to Venice, Calif, get a small apartment close to Gold's Gym and start pounding away, giving it your best shot. Chances are you'll have to take a part-time job to pay the bills between the training and the eating, but you should still have plenty of spare time. This is where you have to be smart. Instead of wasting your time hanging out on the beach, enroll in a distance-learning program and boost your credentials. There are many classes being offered online (I'll be completing my Web Publishing degree by spring next year, without having set foot in a class room! ), so there really is no excuse to not get a backup plan for you. Let's face it - a failed bodybuilder without a college degree doesn't have much to fall back on, except a career as a mover or a bouncer. Another thing you want to consider when making a serious run for the pro ranks is that experience counts. Enroll in small, local contests to get a feel for how the game is played! You will need many competition preparations just to figure out how your body will react to dieting and the stress associated with the competition itself. Posing is another area where experience is priceless. No matter how many times you rehearse your routine in front of the mirror at home, you'll need to be on stage to truly know how it is. Last but not least, you'll have to learn to master the less glamorous details, such as getting the right posing trunks, shaving your body (! ), tanning evenly (white armpits is a classic novice mistake) and oiling yourself up. With a few local competitions under your belt, it's time for you to re-evaluate your goal. Did you win? Did you finish dead last? Did people cheer when you hit a most muscular, or did they laugh and throw things at you? If it's the latter, you should definitely keep your day job and forget the pro ranks. And even if you won, you'll have to ask yourself if it's really what you want to do for a living. If you chose to go for it, you'll have to take it all the way with all it entails, so you better be prepared mentally if you are to succeed. 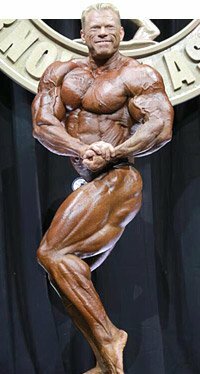 Now, if you have the genetics, you have done well in the local competitions, and you are prepared to do all it takes to become a pro, you have another struggle to face: How do you make a name for yourself, so that you get the all-important face time you need to get the callouts in the serious competitions? Connections, connections, connections. Schmooze. Get noted (in a positive way). But most important of all, you'll have to let your physique speak for itself. Get a solid education to fall back on, no matter how optimistic you are! Do not compromise your health. It's just not worth it! Matt Danielsson has been a weightlifter and personal trainer for over 10 years.